I'm intrigued by the concept of eclectic design. Real, thoughtful, well-edited eclectic design. It's not an easy look to achieve, and it can mean a lot of things. But by pretty much anyone's definition, it's design that doesn't fall into one specific category or period. It's an assortment of things collected or gathered or pulled from a wide range of places, periods and styles. In terms of design magazines, it's Elle Decor. It's Domino (which isn't around anymore - and I'm still upset about it). It's not your grandmother's eclectic. It's not your grandmother's anything. Unless your grandmother is really, really cool. The reason I love eclectic design is because it's personal, interesting, quirky, inherently stylish and fun. In other words, not boring. If there's one thing that doesn't appeal to me in design, it's bland. I love it when a space oozes the personality of its owners. And when you stop to think about it, not many do. Most of us just "fill the spaces with wood in places" (sorry - I can never resist a John Mayer reference) the same way our parents did or our friends do with little thought about how or why things appeal to us. Or buy things just because they're on sale. Or fill a spot with something just to fill it, not because we love what it's filled with. You get my point. And eclectic design, well-executed, is rarely that way. Because to make random objects gleaned from various places - flea markets, favorite stores, parents' attics, your travels - come together in a way that works isn't easy. It takes trial and error. It takes editing. It takes mad skills, really. And you just don't go to all that trouble if it's not a labor of love. 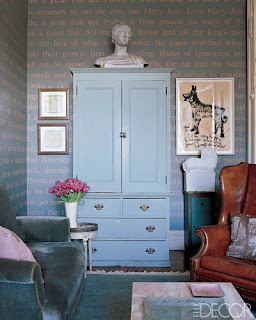 Two notes: The above photo is from Elle Decor and was taken in designer Sheila Bridges' Harlem loft. And the story I recently wrote for The Commercial Appeal on eclectic design is at http://www.commercialappeal.com/news/2010/aug/13/mix-not-match/. And sometimes a room like that is modern. And sometimes it's not. One of the designers I interviewed, Lee Pruitt, summed up the difference in a really nice, succinct way. He said, "Modern is a period in art, and contemporary is now." I'll spare you the entire history lesson, but the word "modern" refers to Modernism, which is a specific era in design history - basically the early to mid-20th century. The Modern movement rebelled against the fussiness of the periods that preceded it and, in architecture and design at least, was popularized by a small group of architects and designers that included Ludwig Mies van der Rohe, Le Corbusier and Walter Gropius. Modern design is not only still popular, but in recent years, it's seen a total resurgence. So many things I see in catalogs of contemporary retailers like CB2, West Elm, etc. are takeoffs of modern designs. And Design Within Reach offers an amazing lineup of products created from authentic modern classic designs. 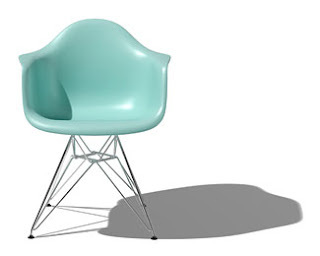 Like the molded plastic armchair by Ray and Charles Eames pictured above. Sleek, gorgeous, interesting ... and so right now (in other words, contemporary).